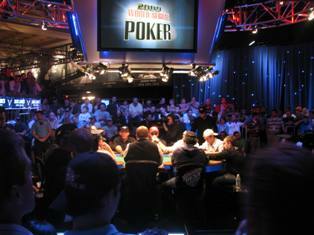 As is to be expected in a $50k buy-in tournament featuring an 8-game format the final table of the $50k Players Championship at the 2011 World Series of Poker is absolutely stacked with names like 2011 WSOP bracelet winner Brian Rast, Phil Hellmuth looking to improve upon two runner-up finishes in 2011, 2011 WPT Champion Scott Seiver, and 2011 WSOP POY frontrunner Ben Lamb. However, all of the remaining players are looking up at massive chip-leader Minh Ly who accumulated a massive stack of over 5 million chips on Tuesday, with his nearest opponent Brian Rast at just 2.6 million! Unlike the previous days of the tournament which featured a rotation of 8-games, the final table will be played strictly as a No Limit Holdem tournament. The structure change will likely favor Matt Glantz, George Lind, Ben Lamb, and Scott Seiver the most –all of whom are known for their NLHE play, while players like Ly, Rast, and Lester are more adept at all of the games, and will likely lose a little bit of their edge as the tournament switches to NLHE exclusively. This entry was posted on Wednesday, July 6th, 2011 at 8:38 am and is filed under Poker News. You can follow any responses to this entry through the RSS 2.0 feed. You can leave a response, or trackback from your own site.